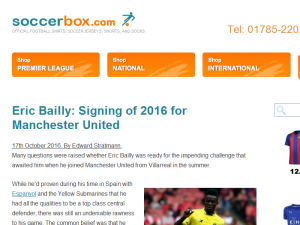 The Soccer Box blog provides you with a fantastic resource for football news and articles. With everything from updates from the Premier League and the gossip on national teams around the world, the blog is ideal for football fans looking to keep up with transfers, results and dressing room rumours. You'll find details on the latest football shirts, shorts, jerseys and kits too. A simple and inntglileet point, well made. Thanks! This what your Soccer Box Football Blog Blog Ad will look like to visitors! Of course you will want to use keywords and ad targeting to get the most out of your ad campaign! So purchase an ad space today before there all gone! If you are the owner of Soccer Box Football Blog, or someone who enjoys this blog why not upgrade it to a Featured Listing or Permanent Listing?